In today’s modern world, a lot of folks are working part-time or even remotely, with face-time often becoming that of video conference calls. We’re sure many BCL members can relate! 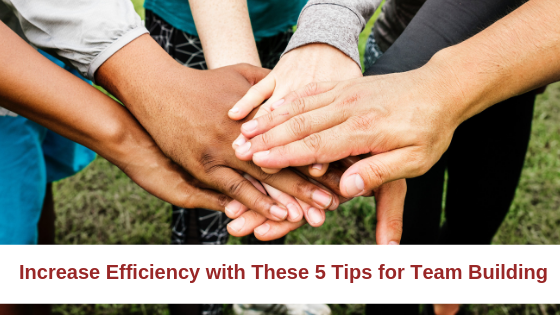 Though meetings and conference calls are helpful tools to check-in and keep each other apprised of the work at hand, it’s also critical to step back from the day-to-day and lay down a foundation that will keep your team united. Team-building activities positively impact your organization. Whether you’re all working in the same office or have some employees working remotely, here are a few tips to help you stay on the same page when it comes to functioning as a unit and building the business. Whether it’s through Trello, Slack, or Airtable, your team needs to be on the same page regarding your use of communication tools and they need to understand how the tool works. Airtable and Trello are helpful when it comes to project management, and Slack is better for day to day communications, but there should be a clear consensus on how your tools are used, what’s acceptable and not acceptable. For instance, maybe you agree that no one should use Slack to communicate after 7pm on a weekday, unless it’s an absolute emergency. During team meetings, everyone should be contributing to conversations. As the team leader, if you notice an employee trying to get a word in, or actively disengaging, bring them into the conversation. Team members shouldn’t feel like their voice isn’t valued or being heard; encourage employees to participate. Additionally, all meetings should be prepped beforehand with an agenda and perhaps a specific item for each team member to address. This way, everyone knows that they have something to contribute and can feel more empowerment in owning their work. Perhaps you have a consultant that works with your team but works remotely, or even some day-to-day employees who work remotely, at some point, you’ll need to bring everyone together for an in-person meeting. Maybe it’s semi-annual or quarterly, but schedule a few important meetings during the year where your whole team can meet face to face and discuss the business. We’ve got small and large conference rooms on both the 1st and 3rd floor to accommodate your team meetings, just be sure to book your space ahead of time. If you don’t need complete privacy, you can also gather in our spacious cafe lounges on both floors. And, before you get your meeting started, take a look at some suggestions to help you align your team leaders and employees so you can keep everything on track. Show your employees that you respect their opinions and input; that you can trust them to make decisions that will impact your company’s culture. Celebrate their wins, the big ones and the small ones. When you empower your employees, you’re building a stronger internal culture that will positively affect your team, which in turn, will also reflect externally. Find ways to cultivate your employee experience, which is talked about more and more these days, and is just as important as your external customer experience. Don’t feel confined to your office; take your team out and do something engaging and fun. If you’re looking for something with a little physical activity, Brooklyn Boulders here in Gowanus has private events for team building. Tell them your goals, and they’ll plan the rest! Need to bring some new creative solutions to your client? Or maybe your own company needs a bit of invigoration, perhaps a new logo, color scheme, website layout, etc. Bring your employees together (your number one assets) and brainstorm! We’ve got tv screens that can connect to your laptop and white boards with dry erase markers in our conference rooms on the 1st and 3rd floor to facilitate this important process. Brainstorming helps you set goals and have open discussions; they’re also a judgment free zone. This will allow your team to feel free and confident, allowing both your employees and company to flourish. Share your tips with us! What techniques do you feel helps your team grow in a harmonious way that’s beneficial to your bottom line and team morale?